It’s that time of year again! Yay! 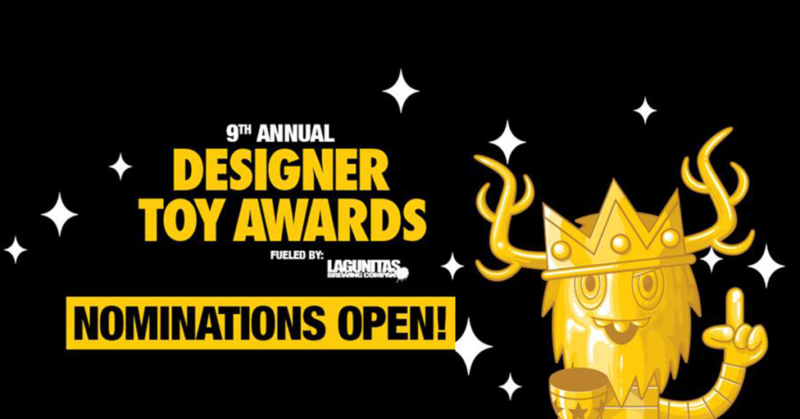 A time when you can joyfully nominate your favourite Designer Toy Artists, Designer Toy Stores, Designer Toy Media Outlets as the Designer Toy Awards 2019 Nominations are now OPEN! Presented by Clutter, the Designer Toy Awards (DTAs) are an annual event honouring excellence and innovation in the field of Designer Toys. With categories like Breakthrough Artist of the Year, Toy of the Year and Artist of the Year (among many others) the DTAs highlight the year’s best designs, concepts and accomplishments by both veterans and newcomers in the diverse world of Designer Toys. Running from now until Feb 28th (6pm EST), nominations can be submitted by clicking “Create Nomination“. (You will need to be logged into your DTA account, or create one). This year’s awards will accept nominations for releases, artists, and companies, that were active from January 1st, 2018 to December 31st, 2018. That’s important to note. 5. Awards Ceremony – The awards are presented at a ceremony on June 1st, 2019, during the weekend of Five Points Festival. For members of the public to attend the ceremony, you must purchase a VIP ticket for Five Points Fest. You can purchase VIP tickets for Five Points HERE!